From the youngest living recipient of the Medal of Honor, an extraordinary inspirational memoir that will change the life of every reader. “Kyle displayed a heroism in the blink of an eye that will inspire for generations” —President Barack Obama, at Kyle Carpenter's Medal of Honor ceremony I want my story to help others see what’s extraordinary in themselves. —Kyle Carpenter On November 21, 2010, U.S. Marine Lance Corporal Kyle Carpenter was posted on a rooftop in Helmand Province, Afghanistan, when an enemy grenade skittered across the roof. Kyle’s post that afternoon, with his friend and fellow Marine Nick Eufrazio, had been eerily quiet; now, with no time to escape, they had to make a split-second decision or they would both be dead. Without a second thought, Kyle jumped on the grenade, a brutal killing device. His vision went blank, his entire body numb, he tried to move but could not. His gear had melted. It felt as though someone was pouring warm water all over him; he dazedly realized that the liquid was his own blood. He had made an instantaneous decision, almost on instinct, one that would change his life forever. Kyle’s heroic act saved Nick Eufrazio's life, but nearly cost Kyle his own. His heart flatlined three times. Wounded from head to toe, Kyle lost his right eye, as well as most of his face from the nose down. It would take dozens of surgeries and almost three years in and out of the hospital to reconstruct his body—and from there, he began the process of rebuilding his life. What he has accomplished in the last five years is truly extraordinary: he’s undergone extensive physical rehabilitation, graduated from college, ran three marathons, and embarked on a new career as a motivational speaker. And in 2014, he was awarded the our nation’s highest military decoration, Medal of Honor, by President Barack Obama, making Carpenter the youngest living recipient of the award. “With that singular act of courage, Kyle, you not only saved your brother in arms, you displayed a heroism in the blink of an eye that will inspire for generations,” stated the president. 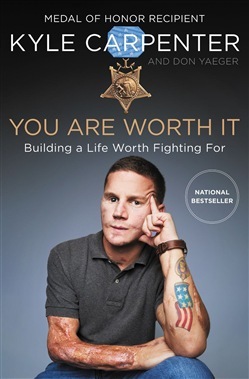 You Are Worth It is a memoir about the War in Afghanistan and Kyle’s heroics, yes, but it also is a manual for living. Organized around the credos that have guided Kyle’s life (from “Don’t Hide Your Scars” to “Call Your Mom”), the book encourages us to become our best selves in the time we've been given on earth. Above all, it’s about finding purpose in life, despite the significant challenges that may come your way. As Kyle writes, addressing us all: “You are worth it. You are. You are worth protecting, you are worth fighting for, you are worth time in a hospital bed and deep scars on my body—because all Americans, the people of Afghanistan, and so many people around the world who go to bed at night wishing to one day taste freedom and peace have inherent worth as human beings. If we don’t spend our time on this earth looking out for one another, what are we really doing with our lives?” Moving and unforgettable, *You Are Worth It *is an astonishing memoir from one of our most extraordinary young leaders. Acquista You Are Worth It in Epub: dopo aver letto l’ebook You Are Worth It di Don Yaeger, Kyle Carpenter ti invitiamo a lasciarci una Recensione qui sotto: sarà utile agli utenti che non abbiano ancora letto questo libro e che vogliano avere delle opinioni altrui. L’opinione su di un libro è molto soggettiva e per questo leggere eventuali recensioni negative non ci dovrà frenare dall’acquisto, anzi dovrà spingerci ad acquistare il libro in fretta per poter dire la nostra ed eventualmente smentire quanto commentato da altri, contribuendo ad arricchire più possibile i commenti e dare sempre più spunti di confronto al pubblico online.